The 38-year-old Kahne made his NASCAR debut in 2002 in the Xfinity Series and two years later in the Cup Series. Since then he has competed in 527 Cup races and 215 Xfinity Series events. In 15 years in the Cup Series, Kahne has earned 18 victories, 27 poles, 93 top-five and 176-top 10 finishes, and led 4,678 laps. His best finish in the point standings came in 2012 when he placed fourth. In 16 years in the Xfinity Series, he ran a limited schedule every year except 2003 when he finished seventh in the driver standings. He won eight of those races, earned nine poles, posted 46 top-five and 87-top 10 finishes, and led 1,378 laps. 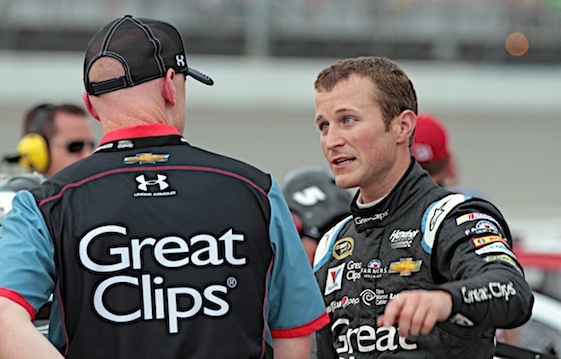 Kahne is scheduled to meet with the media at 9 a.m. Friday at Bristol Motor Speedway. “It’s time for me to be the full-time Dad that I want to be,” Sadler said. In a press conference Thursday at Bristol Motor Speedway, the 43-year-old Sadler said it was simply time for him to move on to the next chapter in his life. “I love being around my wife and kids,” Sadler said. Wyatt, 8, and Austyn, 6, are heavily involved in school and extracurricular activities. The JR Motorsports driver said he was open to running selected races for the Mooresville, N.C.-based team. Even though Sadler “feels good” about his decision, he admits he’s still hungry for a championship. He’s finished second four times in the battle for the Xfinity Series title, including the last two years. Sadler made his Xfinity Series debut in 1995. In 21 years, he has won 13 of the 383 races in which he has competed, recorded 18 poles, posted 102 top-five and 219 top-10 finishes, and led 2,042 laps. Sadler began his Cup Series career in 1997 and competed in 438 races over the next 17 years. He won three races, eight poles, led 1,251 laps and posted 19 top-five and 69 top-10 finishes. Sadler said he had been approached by a couple of different teams about next year, but he had respectively declined because of his loyalty to JR Motorsports. Sadler admitted he began thinking about his retirement at the beginning of the season because he knew it was a contract year. Kelley Earnhardt Miller told Sadler that even though his primary sponsor was leaving at the end of the season, she believed they could still provide him with a full-time ride in 2019. However, he declined. Just like any driver, Sadler has experienced good and bad days in the sport, but he wants the fans to remember that he was a genuine person from a small town who lived his dream.